For those who have questioned Pinterest’s legitimacy as a social media website—largely due to the fact that aside from sending pins to other pinners and the comments section, it has no form of direct communication between users—question no longer. 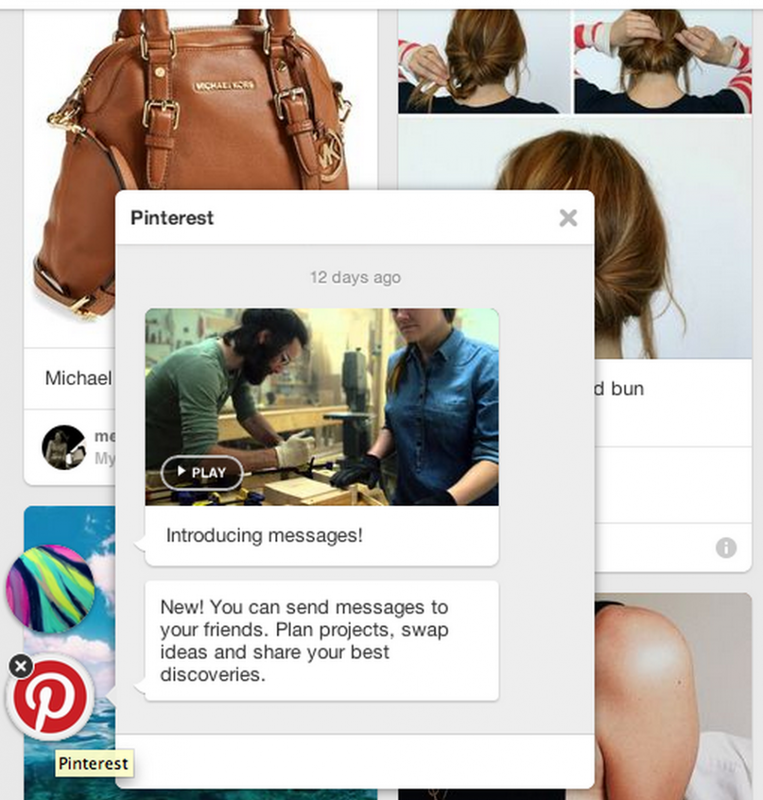 As of August 6, 2014, Pinterest released its new messaging system. Because Pinterest has previously been less of a social site and more of a personal idea and interest site, some users don’t see the need for this feature. As Pinterest, however, becomes increasingly more collaborative and interwoven, its potential for business is reaching an all-time high. The messaging feature allows chat between users on Pinterest, and for those looking to better understand it, I’ve listed a few common questions below. Where can I send messages? How many people can I send messages to? Do I have to send a pin to send a message? How will I use messaging on Pinterest? In order to send a message, both users must be following each other. This decreases the potential for spam, as well as increasing the strength of customer relationships. When I found out Fossil brand liked one of my pins, I was ecstatic—I can only imagine how it would feel to receive a personal message! This also relates to customer service and Pinterest as a new avenue for that. With many store websites and online stores adding a “chat” feature for styling and customer service, Pinterest could be a one-stop shop for many buyers. For more information on online shopping, check out my article “How Women Shop and Buy on the Internet”. Messages appear alongside notifications—which are alerts to repins, new followers, likes, and more—in the top right-hand corner of your home feed. Simply click the word “messages,” and you will be prompted for the user you are trying to message. After you have begun a chat with another user, the chat will appear in a window in the bottom left-hand corner of your home feed, which will look like this. The circle icons are the profile photos of the user you are messaging, and they stack up, so you can conveniently access all of your chats in one area on your home feed. Similar to Facebook, any user can send messages to multiple people, which will open a group message. They do have a limit, however; users can only message nine people at once. This could be huge for businesses that are looking to collaborate with users, reach out to several people at once, or trying to survey a group of people. But, fear not, consumers! Pinterest requires that both users must be following each other in order to send a message. This nearly eliminates all potential for spam and unwanted communication between a brand and its buyers. No. Simply type a message and it will begin a chat with the user. If you have sent pins to the same user before, or other messages, those will show up in the chat window, but messaging can happen with or without sending a pin. Once you open the chat window, you can even drag a pin in from you home feed. Need a quick inspirational video about messaging on Pinterest? Check out this one from Pinterest’s Youtube channel. Pinterest’s intent with messaging is that users will continue to collaborate more. Since the addition of group boards, which I’ve used to bake Valentine’s Day cupcakes with a friend and start a collection of yoga moves with my sister, Pinterest has become much less a personal site for pretty pictures, and much more a community (or many, many communities) of shared interests, new ideas, and great products. …especially when they can tell you exactly what they want. With so many pinners already writing mini “reviews” of products, recipes, workouts, etc., in the description section for pins, messaging could allow businesses to directly address customer concerns, reward loyalty, and get to know their customers better. Check out my section on “What Works for Pinterest” from my article “How to Get Started on Pinterest for Business” to see how Pinterest pages and the “Explore” feature can provide an accurate depiction of a customer’s demographics, preferences, and interests. As I said before, it seems as though Pinterest’s main intent with messaging is that it will allow users to more easily collaborate on projects (DIY is huge on Pinterest). The potential for businesses—small and large—is big. Perhaps Free People wants to reward a pinner with 10,000 followers for pinning so many of their clothes, shoes, and bags. Because that user will already likely be following the brand, Free People will simply need to follow the user in order to contact her or him. They could offer a special coupon code, send a free gift, or simply thank you the user. This is an easy and effective way to increase customer service, like that of a small business. Because so many women, in particular, use Pinterest to shop, this could mean new positions created solely for dealing with a business’ Pinterest account. I mentioned when Fossil liked a pin of mine—it was a lovely mint bag that I have had my eye on for a while. Although this didn’t necessarily prompt me to purchase it right away, I still made a point to visit the store to look for this bag. This is where Fossil, however, failed. I felt extremely pressured by one of the sales associates, especially when I couldn’t find a bag to suite my needs. So, the “like” was just enough attention for me that I felt they appreciated my pin, but the nagging of a salesperson was far too much for me. 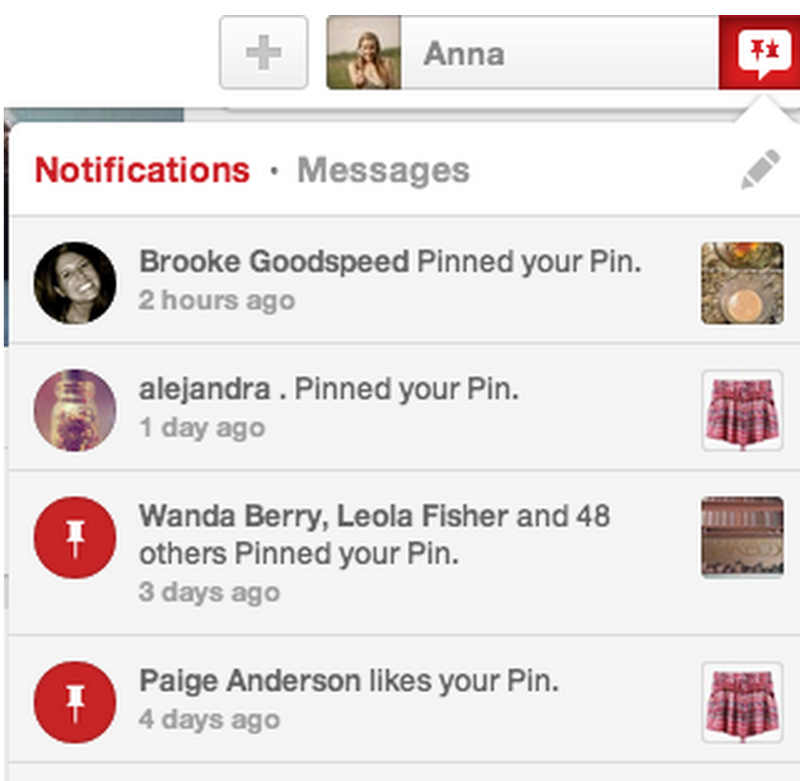 Because it is difficult to establish a life-like presence online, Pinterest’s messaging feature could do just that. Additionally, messaging could aid in ever-popular contests for businesses. By directly contacting influential followers and other popular pinners, a business could much more widely and effectively notify its followers about competitions, new boards, surveys, and more. Pinterest’s blog also details a few specific examples of how businesses are already utilizing the feature to their advantage. A design consultancy, Beratungspuzzle, sends clients to a particular visuals board, and then communicates with them to find how to create their perfect logo. To read more about their strategy, go to Pinterest’s business blog here. The possibilities seem endless. Gyms could communicate with clients to create personal fitness boards, a family could plan dinner online, small businesses could contact users across the country and the world. Try out messaging for your business or personal use, and comment below on your experience!